Which museum(s) would you recommend to friends as worth a special trip, and why? I'm starting a list. A list that is a response to the bogus lists that cheesy magazines make of the "Top 10 Science Museums" or "The Top 10 Children's Museums." So help me create the list of "Museums Worth a Special Trip." In the "Comments" section below, name the museum, and most importantly, tell WHY you think it's worth a special trip. Pound for pound, still two (a children's museum and a science museum on the same "campus") of the most charming museum spaces around. Packed with simple and inventive exhibit ideas. How about you? Please add your "Museums Worth A Special Trip" in the Comments Section below. I second the City Museum in St. Louis. Any museum with a sign that tells you the building is fraught with danger wins all. Also, you get to toast marshmallows and eat them. 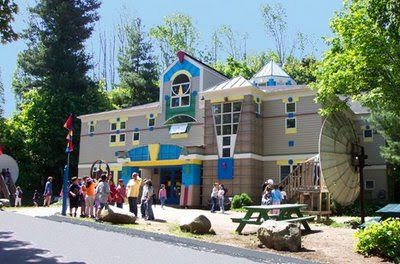 I'm also going to mention the Children's Museum of Evansville - a very young gem of a museum. In a historic building, they've done a great job of maintaining the architecture but still creating a fun space. Pulling the intestines out of the Venus de Milo and playing in the quack factory make it worth the visit! This is one of the few museums where I enjoyed every bit of it, not just one or two galleries. The Contemporary Art Center in Cincinnati. They have devoted their top floor is set aside as a kid space - the UnMuseum - to intro youngsters to contemporary art. As a children's museum person, this makes my heart happy. And Cincy is full of museums, so there's plenty to see! I'll keep thinking. These three are fresh in my brain, so they leap out. I love Explora in Albuquerque. They have done an amazing job. We live near the Exploratorium and of course love that but I think I love the vibe of Explora even more. I could have stayed there for 3 days! My almost 4 year old couldn't get enough. I have to say it's one of my all time favorites. I heartily recommend a visit to the Metropolitan Museum of Art, that has a vast and diverse collection of art. There is art for everyone in this very large institution. From art that is B.C., to contemporary art, the range and quality of the art is excellent. I don't expect everyone to share my tastes in artwork, and that is why I am heartily recommending a trip to this museum. But, speaking of my tastes and love for 19th century European and American landscapes, I am very satisfied after viewing the Met's collection. Oh, and I didn't mention their excellent photography exhibits, on an ongoing basis, and their superb collections and exhibitions of drawings!!! Interesting you mention Children's Museum in Acton -- I worked on an exhibit for them. It's one of the friendliest little museums around! So, what do I think is worth a special trip? I'll assume this is regardless of price, since some are pricey to get into but worth the trip. Also assume that we're limited to North America? just the U.S.? 1. Griffith Observatory in LA -- it's free to go to, but you do pay for the planetarium show. Disclaimer: I wrote their current exhibits. 2. Music Experience Project/SciFi museum in Seattle. I could have spent days in there. Cute little signs in the bathrooms have symbols for men/women/aliens. Little touches like that make it very cool. No disclaimer. 3. Crazy Horse Monument near Hot Springs, SoDak. The monument itself is the museum, but there is a gallery that's worth exploring. 4. California Academy of Sciences. Pricey, but the aquarium alone is worth the price of admission. Disclaimer: I wrote their climate change exhibits. 5. Heard Museum in Phoenix, AZ. I don't know what they charge to get in, but they have an amazing collection of Native arts and such. 6. The Arizona Sonora Desert Museum. Only been there once, but if you and yours are into plants and animals, particularly of the desert, this is THE place. We spent an entire day there, could have spent several. The little guys among us were enthralled. 7. Lowell Observatory in Flagstaff, Az. Not technically a museum, although it has museum-piece observatory equipment. 8. Getty Museum, Los Angeles. Admission is free, but parking is charged by the car. Last time I was there it was 7.00. The galleries are amazing, but what I really liked were the gardens. I haven't been to the Getty Villa. 9. Museum of Anthropology --hands down one of my favorites. It is spacious, encourages exploration, and has some of the most fascinating exhibits of Inuit, Tlingit and other northwestern native arts. When I was there, there were school kids everywhere having a wonderful time. 10. Forney Museum of Transportation, in Denver, CO. I used to spend a lot of time at this one when I was a kid and it was the Forney Train Museum. It's moved from its old location and expanded its collections. Some really cool old gadgets in there. It also reminds me of the exhibits at Luray Caverns, in Virginia. Darn -- forgot to put in my last that the Museum of Anthropology is on the University of British Columbia campus in Vancouver, BC, Canada. I'll play! I'm also a fan of Acton Discovery, City Museum, and EMP. 1. Museum of Jurassic Technology in LA. 2. American Visionary Art Museum in Baltimore, especially during art car season. 3. MIT Museum for the Arthur Ganson exhibit. 4. Montshire Museum in Vermont. Interesting to see which museums come up more than once ... those must be REALLY worth a special trip! My first two would be very long trips, but if I had the $, I would make a special trip to these without hesitation. 1. Musee Marmotan Monet. Because the large Wysteria canvas there can hold my attention for hours. Plus, Impression, Sunrise is there. 2. Tate Modern. Because of the Rothko room (Seagram Murals). Sitting in that room can shift your perspective and is one of the only places I've been able to quietly engage with Rothko colorfield paintings. Plus it is a great, dynamic and bustling museum. 3. Art Institute of Chicago. Because of the Joseph Cornell collection. I love love looove the City Museum - so I second ..or third...or whatever that. I would add the Cleveland Museum of Art. I could live there, I think. Sorry for the transgression. Didn't realize. Maybe I was raised by wolves. The Sir John Soane's House Museum in London - an amazing cabinet of curiosities. The St. Johnsbury Athenaeum in Vermont - 19th century paintings and sculputre displayed in the manner in which it was collected. The Fairbanks Museum, also in St.Johnsbury, VT for their unusual natural history collection and planetarium. And I second Nina on the Montshire Museum. I love that they have their HVAC equipment room on display, color coded and labeled. Also, Calke Abbey. It is an English Country House that has these amazing natural history collections. And the National Trust (UK) has frozen it in time as they got it - so peeling wallpaper, stuff piled on beds, everything. Evocative, amazing. American Museum of Natural History - mostly because it has such a big impact on kids in general. Tenement Museum and Holocaust Museum - so many people tell me how moving, thought-provoking, and even perspective-changing these two museums are. Lady Lever Art Gallery (outside Liverpool) - jewel box of Pre-Raphaelite art. Victoria & Albert Museum (I am a decorative arts geek . . . . and an anglophile - I keep coming up with British museums). Then, stop in town and go into the little public library. It is a small white Greek Revival building with a surprising little "Museum of Oddities" (free). I won't give away what you'll find there...just suffice it to say that some wealthy people acquired interesting things in the early 1900s. Storm King Art Center in Mountainville, NY. It's a 500 acre outdoor sculpture "park." It's a wonderful space to experience large sculptures. There is even a tram to take you aroud the park because it's so big. The amazing huge modern sculptures in a beautiful natural setting are a great combination. The Tenement Museum in NY--this space and docent-led program truly bring history alive. I have never forgotten it. Being in the authentic space is very powerful, especially since it's not cluttered with museum stuff; it's frozen in time. I also think guided experiences are very powerful, especially with a good storyteller and this space is pefrect for that. The National Building Museum in Washington, DC. The building is a gem and is worth seeing. Take the guided tour and learn about history, architecture, and engineering. The interior space is one-of-a-kind (indoor Italian-looking courtyard and some of the world's tallest columns). The Renwick Gallery (part of the National Museum of American Art)--often overlooked this small museum is one of my favorites. It showcases American crafts and decorative arts. I appreciate intimate spaces such as this one, which is ideal for enjoying the items on view. The objects on view are always interesting (from wacky to beautiful craftsmanship) and the fact that the space is small means that you can really focus on a few objects that grab your attention without feeling hurried that there's more to see. Great place for a beautiful and bizarre picnic under a larger-than-life sculpture outdoors. They bring the visitor into the artists' processes with their labels and a little room that shares videos, sketches, and wee hands-on components that dig deeper into the "behind the scenes" of the current temporary exhibition.